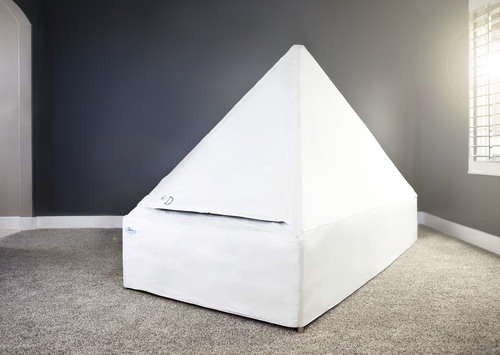 The Zen Float Tent is dubbed the as the world’s most affordable float tank. In this article, we will be discussing its design, standard features, optional add-ons, freebies and the price. The Zen Float Tent looks quite different from any other float tanks I have seen. When you personally see the setup, you will understand why it is the most affordable float tank there is. It is composed of a tub and a tent that covers the entirety of it. 📌You may be surprised to find out that the entirety of the Zen float tanks is made up of steel and canvas. True to its name, the steel frame and canvas are fitted together to create a tub on the base and a tent over it. The steel is made of non-corrosive, heavy duty stainless steel while the canvas is double-layered, waterproof and light-proof vinyl. The shape of the tent is ideal to prevent the condensation from dripping into the floater or the water. The interior is pitch black due to the black color of the inner canvas and totally light-proof even with air vents and a door. Due to the door being a flap, it can easily be entered and exited by the floater. The tub can accommodate a person up to 7.5 feet tall and 3.5 feet wide. The exterior of the tent is all white. The whole float tank only weighs a hundred pounds but it can easily handle 201 gallons of water, or approximately 10 inches of water. The Zen float tank does not have any external wiring or plumbing system but it does have a built-in mechanical UV filtration system and a radiant heating control system. The radiant heating system is made up of heating pads that are placed throughout the tank. The Zen Float Tent is designed in a way that users may be able to customize or add extra features all on their own if they wish without diminishing the quality and performance of the unit. There are only two models available now which is the North America model and the International model which cost the same. These are the only difference between them. A basic Zen Float tank package, whether international or for North America, only costs $1,940 including the freebies mentioned above. If you wish to get a better deal, you can avail of the Float Package available to North America only. This includes a year’s worth or 850 lbs. of Epsom salt. The Zen float tank is easily collapsed and packaged in two boxes. Shipping may take around $100 to $1,000 depending on your location. It comes with an installation manual so that you may assemble it yourself. If you add the cost of water, electricity and maintenance, you will be spending about $50 to $100 a year running your own home float tank. Lightweight and easy to assemble and disassemble. Most affordable of all ready-to-use float tanks. Most cost-effective to run and maintain. International model costs the same as US model. International model does not have all features needed to run the float tank right away. The tank is clearly made for you if you have a tight budget and would like a float tank that is bare-bones basic. Owning a Zen float tank will let you recover the cost in a year’s worth of float sessions. I highly recommend this float tank review to you if you are looking for your first float tank. You may also check out our other float tank reviews if you want to see the other brands that we highly recommend.